Elizabeth Gilbert's Facebook page had this fabulous post on it today. Thank you Thia Stephan for sending it to me! I wanted to post it here - and I couldn't say it better! Question of the Day: HOW DO YOU DEAL WITH CRITICISM? The other night at a book event in Kansas, a woman asked me how I deal with criticism about my work and about myself — particularly online criticism. It's a question that comes up a lot, so I thought I would take on the subject today, with the hopes that my words might help some of you — no matter who you are, or what you are doing with your life. 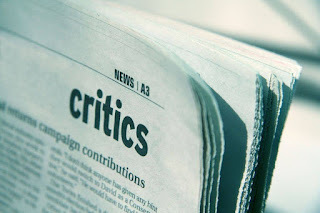 The simplest answer for me, when people ask me how i deal with criticism is to say, "I don't." I don't look at it, and I don't look for it. I avoid criticism about myself not because I DON'T care what people say about me, but because I DO care. I am sensitive and easily bruised. I know that critical words can hurt me, and I am not in the business of hurting myself on purpose. There are major reviews that have been written about my work in serious, important newspapers that I have never even read. For instance: I know that I got a really bad review of COMMITTED in the New York Times several years ago by the legendary critic Janet Maslin, but I have absolutely no idea what she said about me, and I have no intention of ever finding out. (If you want to Google the review, go right ahead — but I sure won't!) People told me that the review was bad (some of my kind friends warned me, and some of my not-so-kind friends just sent me the link — thanks, pals!) In all cases, I said, "Thanks for the info — see ya later!" and I turned my head the other way, the same way I turn my head when I pass a car accident on the road, or when the TV news is showing footage of a grisly murder. I think it was the novelist John Updike who said that reading your own reviews is like eating a sandwich that might have some broken glass in it. I have nothing to gain by eating shards of broken glass. It doesn't benefit me or anyone else to digest something that will cause internal bleeding. If the review is nice and kind, on the other hand (and pre-screened by a loving family member) then I will read it. Because guess what? It's really nice to hear people say nice things about your work! And it's rare! So when it happens: Treat yourself! Enjoy the nice review! Which is to say: when that same Janet Maslin revewied THE SIGNATURE OF ALL THINGS in the New York Times and loved it, I treated myself to her review, because there's nothing wrong with treating yourself to a nice sandwich with no broken glass in it. Because we all need to eat sometimes. There are people who might say, "But how can you keep yourself honest as an artist, if you only listen to the good stuff, and don't pay attention to your negative critics?" I say in return: "It is MY own job to stay honest as an artist; it is not the job of the critic to keep me honest." The critic doesn't work for me; the critic works for the newspaper. The critic has her own responsibility to keep herself honest, but she is not required to help me out, or to be a midwife to my career, or to have my best interests at heart. That is not the nature of our relationship. I do not resent that critics exist; this is a natural part of the creative landscape. But I do not listen to criticism from people who do not have my best interests at heart, because it does not serve me or make me a better person. 1) Do I trust your opinion and your taste? 2) Do I trust that you will understand what I am trying to create, and therefore can help me to improve it? 3) Do I trust that you have my best interests at heart — that there is no dark ulterior motive, and no hidden agenda in your criticism? 4) Do I trust that you can offer your criticism with a fundamental spirit of gentleness, so that I can actually hear it without being mortally wounded? Because let's talk about "brutally honest". You know that friend of yours who proudly advertises herself as "brutally honest"? Yeah, well I know her, too. We all have a friend like that in our lives. Listen to me, dear ones: NEVER let her see your work; never ask her opinion; never show her your vulnerability. When somebody tells you that she is brutally honest, what she is actually telling you is ,"I am brutal." What she is communicating to you is this: "You can trust that I am waiting for a chance to brutalize you. Now please give me an opportunity to hurt you." I don't volunteer to be brutalized. Again, I don't hate myself that much. Brutal honesty is no virtue. Honesty without kindness is not worth the price you pay for it. I can listen to honesty, but only when it comes from a whole-hearted person, who is not trying to draw blood. As for WHEN I listen to criticism? I only listen when there is still a chance to fix or change the work. After the book is published, THERE IS NOTHING MORE I CAN DO ABOUT IT — so why would I go digging for criticism after the book is already printed, and it's too late? The age of the Internet has made it easier than ever for us to find out horrible things about ourselves. Anything we put online or into the world is subject to attack, derision, insult. But this doesn't make the Internet an evil place. (Look how kind we are to each other on this Facebook page, for instance!) The Internet is also a glorious playground, where you can put yourself out there in ways humans have never been able to enjoy before. So enjoy that playground, and put your work forward. But don't read the COMMENTS, you guys. Just don't. And don't Google your name, unless you are looking for further self-injury. Sometimes, of course, you can't avoid seeing nasty things. Stuff pops up on Twitter and Facebook that is mean and harsh. Block it, mute it, move on. Don't feed the trolls. Don't engage. And never let the trolls stop you from using the miracle that is Internet. You have a right to speak, and a right to put your work forward, and a right to find your audience. Just keep putting yourself out there, and then — whenever possible — turn your head away from the reaction that may result. DO NOT put something out there into the world, and then go searching for an evil reaction to yourself or to your work. DO NOT sit wide awake at 1am (usually with a pint of ice cream in your hand) and start digging until you find a horrible response. DO NOT sit there all alone in a darkened room with the blue light of the computer shining on your face, scrolling and scrolling and scrolling through all the nice things people have to say about you (and ignoring every single kind and generous and supportive comment) until — VOILA! — you finally find what you were looking for. Don't go excavating until you finally find that one wickedly cruel comment that proves what you have always suspected in the darkest nightmare corner of your mind — that yes, you are a fraud, you have no talent, you are fat and ugly and worthless and pathetic. DO NOT go digging, as I have seen my friends do so many times. Because if you dig long enough, you will find it. You will find the pain you were looking for. Scrolling through the COMMENTS about yourself is like reading your roommate's diary: It's so tempting, because it's sitting right there! But if you read long enough, eventually you will find something about yourself that will break your heart. Don't do it. Put it down. Resist the temptation. Show the self-discipline that is necessary for self-care. Walk away. I've watched creative friends of mine do such harm to themselves and their work, by digging through all the nutritional output about themselves until they finally find the one shard of glass in the sandwich, and then they take that shard of glass and cut themselves deeply with it. Sometimes those wounds last forever. And then they wonder why it's so hard to be creative again. I refuse to do it. I refuse to hate myself that much. It's hard enough to be creative, but I refuse to fill my creative space (my skull) with cruel and taunting words that will just make it all the worse. Refusing to read nasty things about myself is not denial; it is AFFIRMATION. This is how I affirm my own life and my own creativity. This is how I protect myself, because I am the only one who can protect myself. This is how I keep the inside of my mind clean and fresh and ready to play again. I want you all to put yourselves out there in the world — especially all you women! We need your voices, we need your creativity, we need your courage, we need your output. But do understand this: If you put yourself out there in the world, everyone has a right to respond to you however they want to — that's the contract. They can attack you, they can insult you, they can undermine you. BUT YOU ARE NOT OBLIGED TO LISTEN TO THEM. Turn your head from the violence. Find people to trust, and listen ONLY to them. Once you put your work out there, your work is finished. Let it go and walk away. Keep doing your work, keep putting yourself forward, and then turn your head from the darkness. Take care of yourself. Create freely. Share bravely. But never go digging for broken glass.